This is week 2 of our blog hop. Myself and the fabulous group of gals who make up Primary Peeps are coming to you each week with some tips and tools for you to use in your classroom. Last week, Leah Grasty from Grasty's Second Grade Goodies shared with us a fabulous freebie of a math planning guide for second grade. We are talking daily lessons, aligned to the common core with all (yes, all!) the planning done for you. Woah! This week the fabulous Missy from Dirt Road Teacher is sharing her thoughts and ideas on using parent volunteers in the classroom. Do you use parent volunteers in your classroom. I'd love for you to share with us your thoughts and ideas in the comments below. I really do love hearing from other teachers! In my district, I am required to use parents in my classroom on a daily basis. Dirt Road Teacher's fabulous volunteer contract is a great resource for both myself and parents. Just like the kiddos, I have found that when parents know clearly what they will be doing, some classroom rules and procedures, expectations, etc. they are much more effective in the classroom and the experience goes much more smoothly. 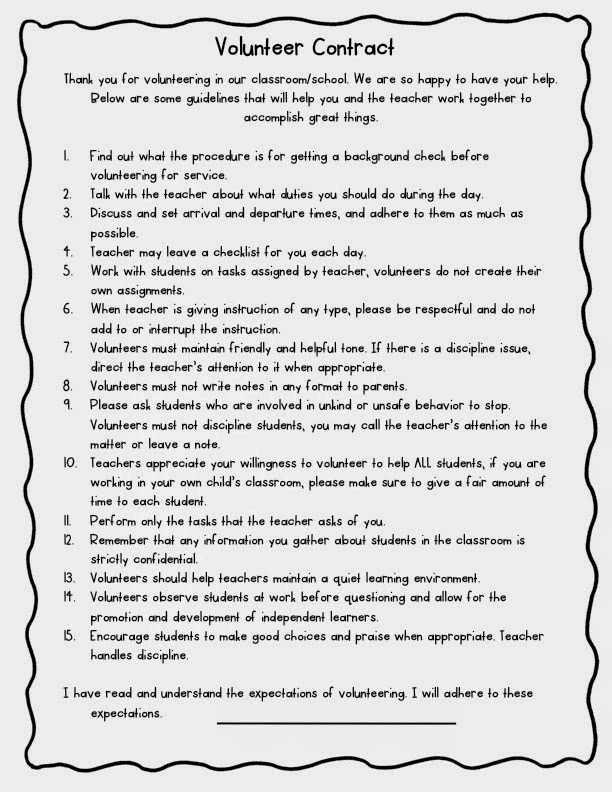 Dirt Road Teacher has shared a great "to do" list for volunteers as well as this volunteer contract on her blog. They are both free! You can check them out here. I use parents in my classroom during Daily 5. I assign rotations, rather than let the students choose. This is a huge timesaver. After my mini lesson, when the kiddos begin their rotations, I work with my leveled guided reading groups. The parent volunteers assists students as they complete various ELA tasks (read to self, read to someone, writing, listening and word work.) Since we use iPads during Daily 5 sometimes a parent may assist a student with an app, or help a student with "word work." She may ask a pair of students engaged in "read to someone" some comprehension or story element questions based on the text they are reading. A "to do list" and contract such as those Dirt Road Teacher has provided are the perfect way to make directions and expectations clear. Sometimes with 20 little friends who all need my attention right this very minute, it can be hard to engage in going over the rules/procedures especially when I have a different parent in every day. This is a perfect timesaver. Many thanks, Missy!